Askeli is a stretch of beaches located on the eastern part of the island. The beaches are mostly sandy, they have sun beds and umbrellas provided by nearby hotels and cafes. 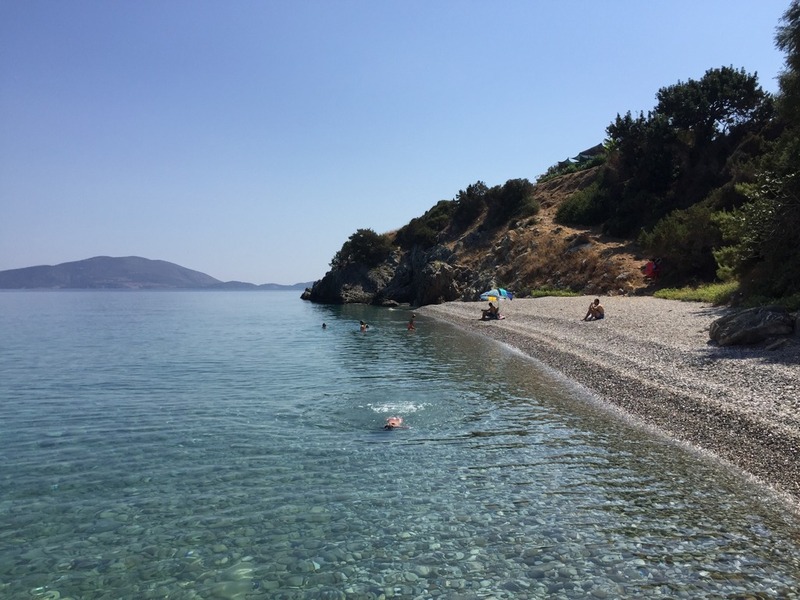 Askeli belongs to the more commercialised beaches, which gets rather busy in summer months (due to surrounding hotels), but the water is still very clear and perfect for swimming. There is also a water sports facility in Askeli beach for those keen on some adventure. Get there by bicycle, scooter/quad bike, bus (summer months), car or taxi (4-5 EUR ride) or walk (20 minutes) from the port of Poros. Monastiri or Monastery beach is located a 5 min drive from Askeli, right below the 18th century Byzantine monastery (hence the name). Locally this beach it is known for its clear waters, perfect for diving or snorkelling. Or just relaxing time. It is secluded and less frequented by the tourists. You can get there by bicycle, scooter/quad bike, car or taxi (7-8 EUR ride). 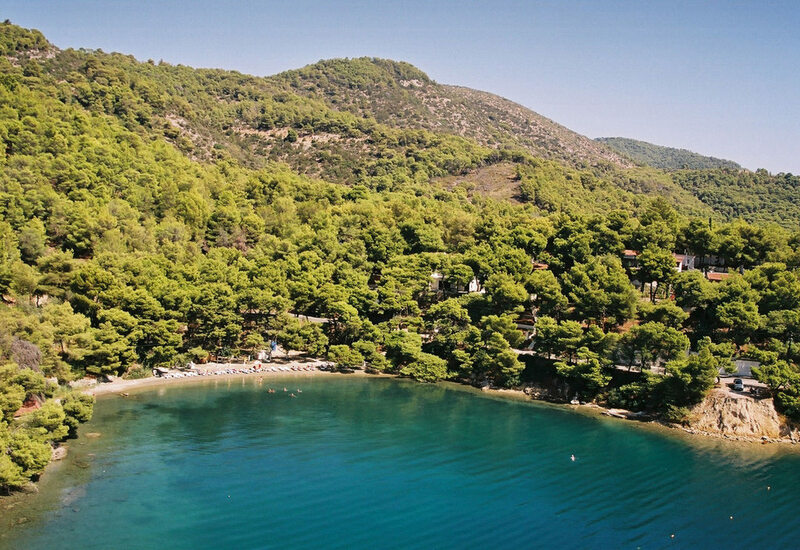 Sirene Blue is one of the 4* hotels on Poros. It is located just before the Monastiri beach, which means it also takes advantage of the crystal clear waters of that part of the island. The hotel has built a fantastic outdoors area with a wooden deck with sun beds, umbrellas and ladders going into the sea. Non hotel guests are welcome too. You can order some lovely drinks and snacks from the hotel restaurant. Sirene Blue also has a beautiful spa where you can book a treatment of your choice. Just call them beforehand as they do get busy. You can get there by bicycle, scooter/quad bike, car or taxi (7-8 EUR ride). 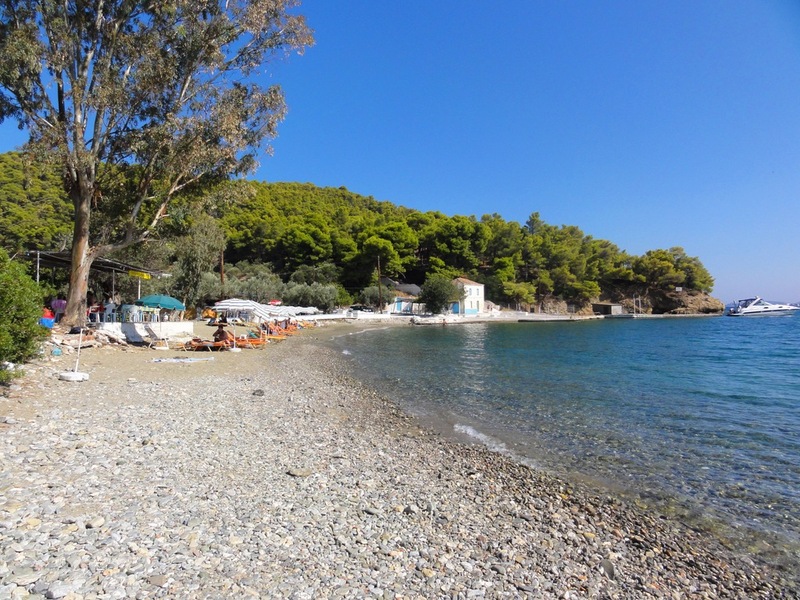 Probably one of the most popular beaches on Poros, Love Bay, is located on the western part of the island among evergreen pine trees hovering over the sandy beach, giving it extra shade and romantic ambiance. The only problem is its popularity – it tends to get very busy in summer months. But due to limited space/sun beds, first come first served rule applies! You can grab yummy, refreshing drinks (try their watermelon smoothie!) and snacks from their beach bar and even rent a kayak if you feel like some activity. Get there by bicycle, scooter/quad bike, car or taxi (around 6-7 EUR ride). 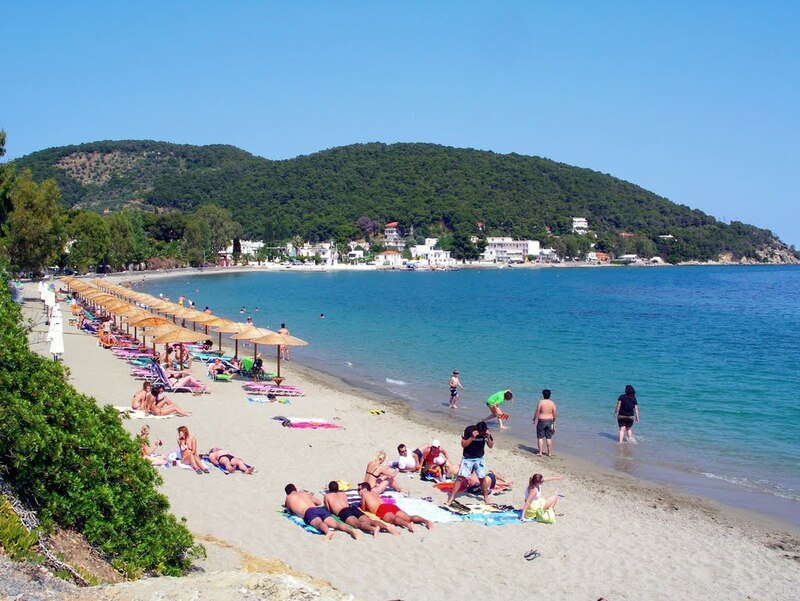 Located a bay after Love Bay, Russian bay also belongs to the more popular beaches on Poros. However, it is much bigger than Love Bay and its relateively more remote position makes it a bit more secluded. Russian bay has been named after the Russian naval base ruins from the Ottoman-Russian war in the 19th century, which are still well preserved and reign over the beach, giving it a mysterious feel. Every now and then you can encounter local goats, which stroll around the beach looking for food and drinking sea water (yes, goats can drink sea water!). Russian bay also has a beach bar, which is run by 2 lovely Greek ladies, who prepare proper meals if one is interested. Get there by bicycle, scooter/quad bike, car or taxi (around 7-8 EUR ride). Daskalio or Teacher’s island is a tiny piece of land in a shape of a heart, located right in front of the Russian bay. You can get there only by boat (or swim from Russian bay if you feel brave enough!). 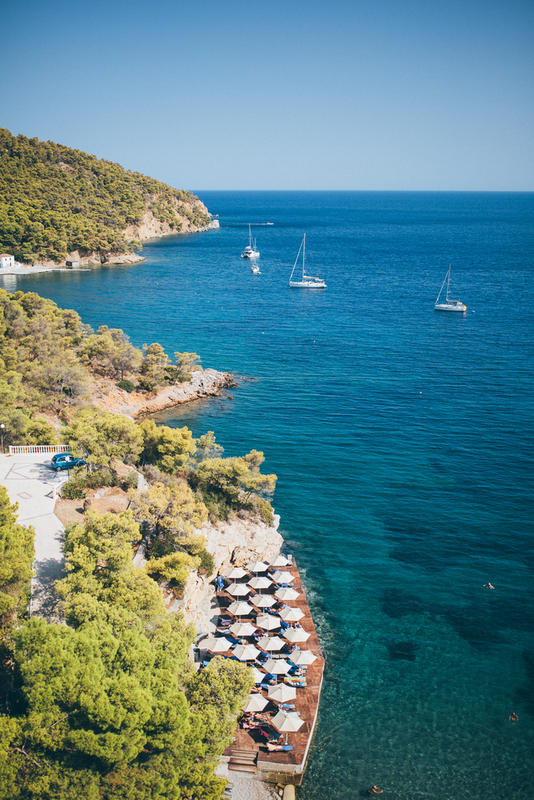 The beaches are miniature, but once on the island, you have a spectacular 360 degrees view to Poros and Peloponnese. If you are lucky, you will be the only person there (although bear in mind you might have neighbours on the yachts, which like to “park” nearby). Daskalio has a cute, little church making it a very unique spot for marriages (Magdalena and Periklis got married here :-)). The fact that it’s got a shape of a heart makes it probably the most romantic place in the area! 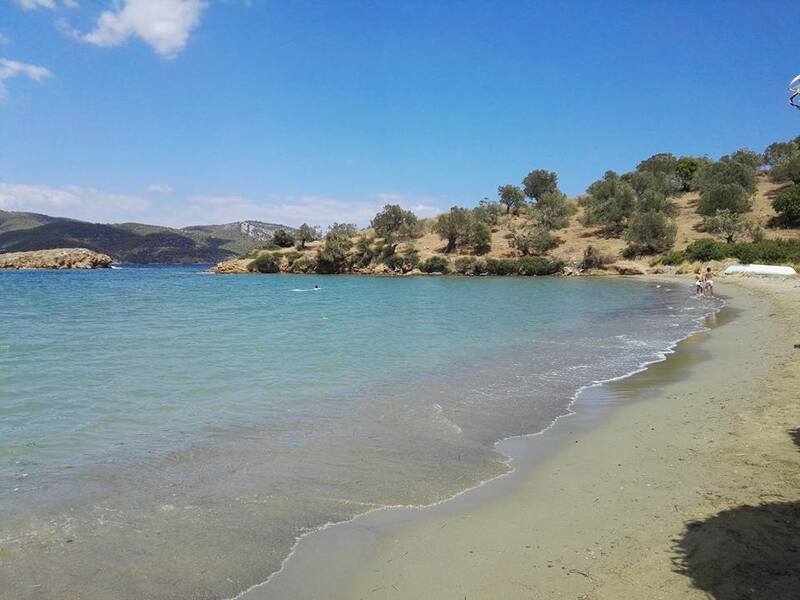 Vayonia bay lays completely on the other side of Poros island, on its northern side. Known only to the locals, it remains one of the most secluded and peaceful beaches to visit, at least outside August. You just need to be careful and monitor the wind. Being on the northern side of the island, it is exposed to the strong, northern winds “visiting” the Saronic in summer. The bay is large and the beach long (both sandy and stoney) making it feel very spacious. There is a gentle decline into the water, which makes it easy even for non swimmers. Right above the beach there is a property, which belongs to Yannis Dontas, who owns and trains horses. He will gladly take you for a ride from his property down to the beach (30min cost 20 EUR) on one of his beautiful horses. Getting there is a bit more tricky as it is a bit too far and hilly to get there by bicycle. You can get there by scooter/quad bike, car or taxi (taxi ride is around 12 EUR). 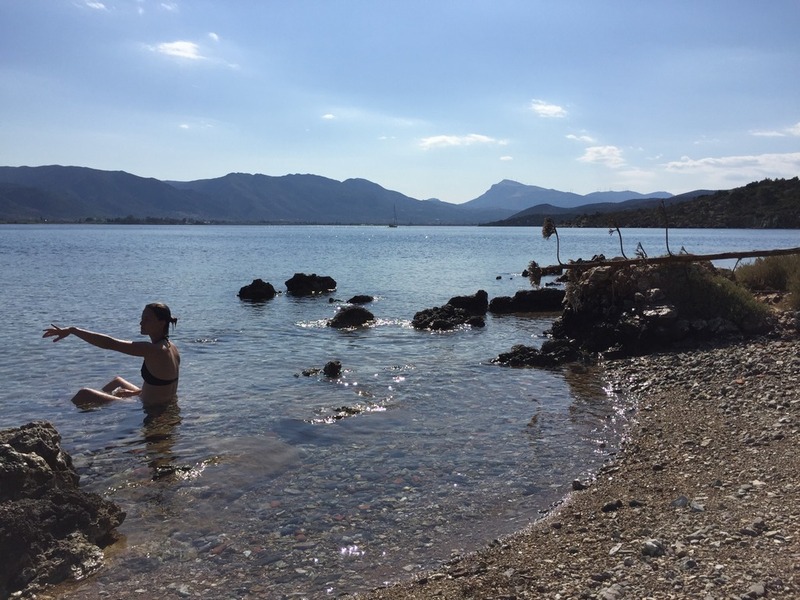 Aliki and the “Hidden beach” are located on the mainland, opposite Poros island, in the vicinity of the Lemonodasos (Lemon grove). 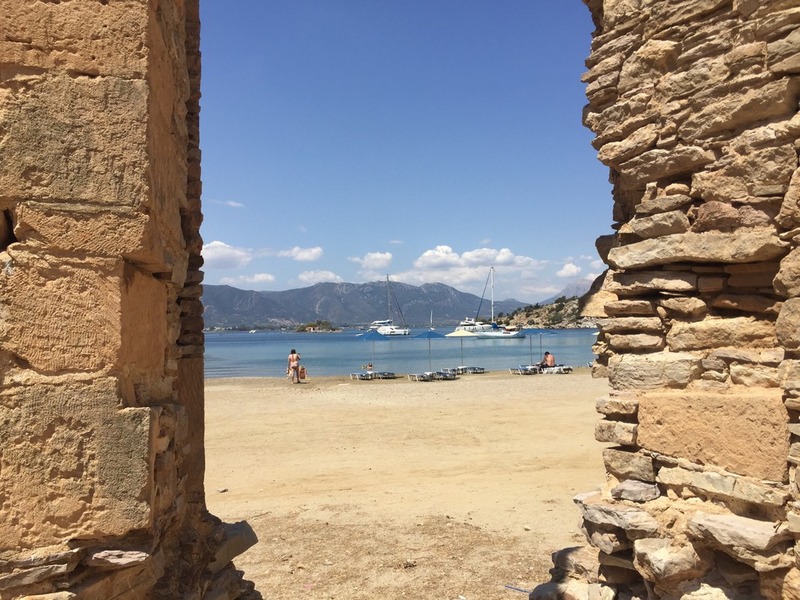 Visited mostly by the locals, far away from the road and secluded in a gorgeous bay facing Poros and other, smaller islands, it is a perfect spot to spend a day on. The beach is sandy, has a gentle decline into the water, making it great also for children and non swimmers. For those that want to do a few rounds in the water, the bay is perfectly shaped for it and quite well protected from the wind. You will find sun beds and umbrellas as well as a beach bar, but there is a part of the beach which is not organised too. Next to Aliki there is a fantastic taverna called “Fotini”, where you can savour traditional, Greek dishes all prepared from locally sourced, organic ingredients. The owner, Fotini, is the biggest football fan and will surely challenge you on your knowledge of European clubs’ football players! From Aliki you can walk to the “Hidden beach”, which is totally wild and very seldom frequented by people. From there you can swim to the nearby little islands, visit caves or practice yoga with us (Live-Bio uses this beach for its yoga sessions)! The best spot also to enjoy the sunset while listening to the sound of the waves. You can get there walking from Galatas town (about 30-35min), on a bicycle, scooter/quad bike, car or taxi (around 6 EUR) from Galatas. From Poros to Galatas you can catch a 24h/7 taxi boat which departs from the main harbour in the town of Poros. It takes 2min and costs 1 EUR. 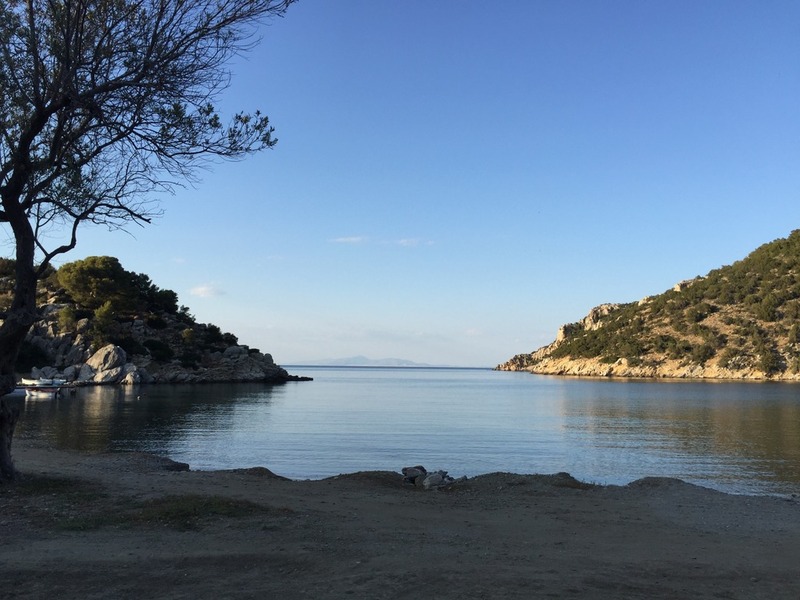 Methana is a peninsula located a 30min drive from Poros/Galatas (mainland). The peninsula has around 40 volcanic springs and its sulfide waters run all the way to the sea, making it a very unique spot. Sulfide is known to have therapeutic capabilities, especially for those suffering from arthritis or joint problems. We definitely recommend going to Methana for a day trip. You can hike the volcano in Kameni Chora, visit the ancient Greek style amphitheatre hand built by a local guy Theodoris, eat a seafood lunch at the fishing village of Vathi and the rest of the time enjoy the sulfide induced waters of Methana. The best beach is the one right at the end of Methana town (also called “La Playa”). It is large, it is sandy and not very well known to the tourists. Get there by scooter/quad bike or car from Galatas village. And we finally got to our number 1! 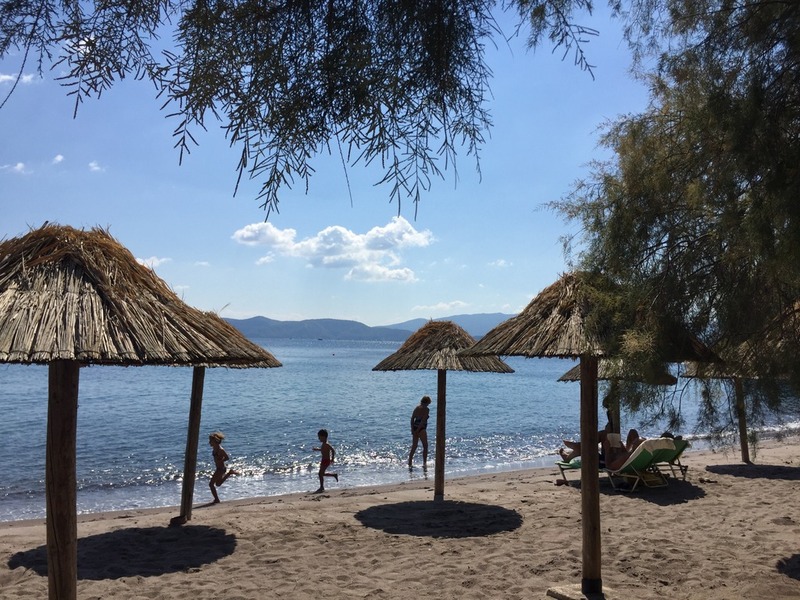 Votsalakia beach in Kalloni (also shown on the featured photo in this blog post) is a true gem, very well protected by the locals. It’s not easy to find it, but once you do, it will be so worth it! Perfectly shaped white pebbles make the water look even more turquoise and it is almost hard to guess where the water actually starts! 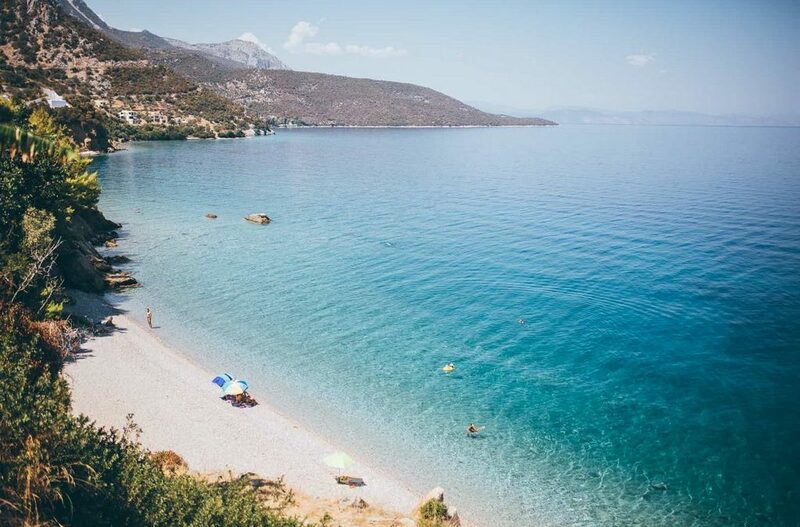 The best thing to do is to stretch yourself right at the shore in the shallow waters, relax while the gentle waves caress you and enjoy the most stunning, 180 degrees views to the Methana peninsula and nearby islands. Or if you are a swimmer, there is plenty space for you to practice! There is a cozy beach bar right on top of the hill (where you would park your car/scooter before you walk down to the beach) called “Cantina”, run by an Athenian musician who comes each summer to treat his customers to delicious strawberry or watermelon smoothies (they can be alcohol infused if you wish ;-)). Far away from the main road, it is completely secluded and it almost feels like you’ve entered a special “private club” of the lucky ones who manage to find this magical spot! You can only get there by car or scooter/quad bike (from Galatas it takes about 20-25min).